There are many kinds of fly which can make a nuisance of themselves but houseflies and bluebottles are particular pests each summer. Though they are similar in many ways, there are some differences between them, which may be important when it comes to dealing with the problems they cause, so being able to tell them apart can sometimes be a big help. Houseflies lay their eggs in moist, decaying matter especially household refuse, manure or compost – unlike bluebottles which exclusively lay on dead animal bodies, meat or cheese. Under ideal conditions the whole lifecycle – from egg to maggot to adult – can take place in less than a fortnight. As adults, houseflies can fly distances of five miles or more, so they have little difficulty travelling from these breeding sites to enter our homes. The two kinds can easily be told apart when adult, houseflies having a series of stripes along their mid-section, while bluebottles are a distinctive metallic blue. However, the larvae are almost indistinguishable except for size, the full-grown bluebottle maggot being larger, though where it is found and the type of material it is eating is usually a good indicator. 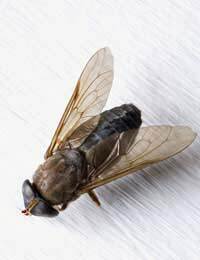 Houseflies generally have rather erratic flight patterns and can often be found in very large numbers flying around light fittings; bluebottles tend to invade in ones and twos. The sudden appearance of clouds of bluebottles can often be the rather gruesome sign that some unfortunate mouse or small bird has died under your floorboards or up the chimney – and is about to provide a fertile breeding ground! Flies generally enter houses in search of food and as they are not fussy feeders, will have a taste of any likely meal they land on. The wide and rather unsavoury eating habits of both kinds of flies makes them a potential risk to human health, contaminating food destined for the table with bacteria from the decaying material or animal droppings on which they fed earlier. In addition, they can transmit intestinal worms and are known carriers of a variety of diseases, including gastroenteritis – the need to cover and protect food when flies are likely to be around is well known. Good hygiene and a few sensible precautions, such as frequent cleaning of the kitchen drains, disposing of scraps carefully and keeping waste – and compost – in secure bins, form the best approach to controlling fly problems in the long term. Removing their easy access to food and breeding sites takes away their reason for coming in the first place. However, in the short term there are some other more immediate measures which can be effective in helping to control these insects. “Knock down” fly sprays offer an instant means of attack. Some of these products, can even be used in kitchens and food preparation areas – but this is not the case for all of them, so be sure to check the product label. Outside of the kitchen, surfaces that flies tend to land on can be sprayed with a residual insecticide. In recent years a variety of electric ultra-violet insect killers have come on the market which are far more suited to the domestic kitchen than the more familiar large designs intended for food retailers and catering establishments. Although their effectiveness depends on where they are located and some varieties of houseflies are not attracted to them, they offer effective protection in a stylish contemporary design. For those who enjoy a more personal “hunt” there are even electric fly swats available, making insect electrocution into a more portable option. Modern ultrasonic devices have also been developed which emit high-frequency sounds designed to disturb the flies and ultimately drive them away, some people having reported great success such products. Some of the older remedies may also have something to offer. Fly papers, window-meshes and door screens, for example, may not be the most attractive additions to a household but they can certainly be effective in their place. Other types of flies can sometimes make their presence felt, such as cluster-flies which may congregate in large numbers over-winter in the roof-space or the aptly named sweat-flies which form irritating clouds around the heads of summer woodland walkers. However, few come even close to bluebottles and houseflies either for out-and-out annoyance or as potential health hazards – so knowing your enemy and how to deal with it should go a long way towards giving you the upper hand. Inundated with house flies - small but two days running in my kitchen and sitting room - keeping doors to rest of flat shut. They hang around the light shade so I’ve been trying to hoover - hope to get some pest spray or something tomorrow but I can’t figure out where they’ve come from. As they’re small have they hatched in my flat somehow? Disgusting and I’ll have to disinfect all kitchen surfaces. Is it ok to spray in kitchen? All suggestions welcome! For the pastdays flies have been appearing one at a time, up to 30 a day. There is no smell and we cant find any food etc. Please can I have advice its freaking me out!!!! @Ry - I know how you feel. It seems to be worse in August. I think it's the fact that our bins are only emptied once a fortnight. I opened mine and a load flew out. Horrid. Open all the windows in the house. It's the only way. They will find their way out. I'm sure they don't like being interned. I have had 300 plus flies in my kitchen over the past five days, we had a rodent smell last week. They seem to be coming from the cupboard under the sink.When something has died before we have had a few bluebottles but nothing like this.Just wondered why we got flies this time and no bluebottles and how many flies normally come from one mouse? As this is in the kitchen I don’t like using fly spray.I have blocked up a few holes outside so hopefully this will not happen again.Thanks for your help. We have been experiencing blue bottles for the past couple of month, with maybe one or 2 appearing every few days. Spoke to a pest control guy who said it was unlikely to be due to a dead rodent as we hadn’t smelt anything horrendous. Although back last July when we had just moved in we did have a problem with a rat ( juvennile rat that was quickly dispatched by the pest guy). I’m confused as to where these are coming from as there is no sign of anything decaying in any obvious places. Bluebottles originate from decaying food or in any type of rotting organic matter, such as dead animals. Dog faeces can also be a source. One or two bluebottles every few days does not amount to an infestation, so it may be something that is outside your own home, but in the vicinity. Only if you find the breeding source, will it eliminate the problem (that is, if you consider the occasional one or two bluebottles to be a problem). We have been experiencing blue bottles forthe past couple of month, with maybe one or 2 appearing every few days. Spoke to a pest control guy who said it was unlikely to be due to a dead rodent as we hadn’t smelt anything horrendous. Although back last July when we had just moved in we did have a problem with a rat( juvennilerat that was quickly dispatched by the pest guy). I’m confused as to where these are coming from as there is no sign of anything decaying in any obvious places.